We are proud to present new works by Franziska Furter in her 4th solo exhibition in the gallery. She has created an installative exhibition captivating the viewer through its precise disposition of different groups of works in manifold material. 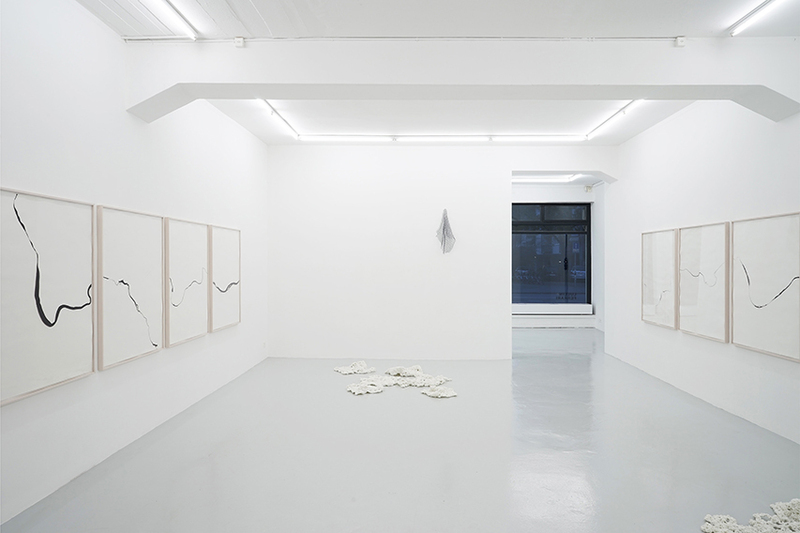 We are proud to present new works by Franziska Furter (*1972 in Zurich) in her fourth solo exhibition in the gallery. The title of the exhibition Waves and Particles hints to the wide range of works shown and allows many associations: On the one hand waves and particles are terms from quantum physics, on the other hand these designations are part of a title of a painting by Mary Heilmann and finally all works presented in the exhibition are covered by these two terms. 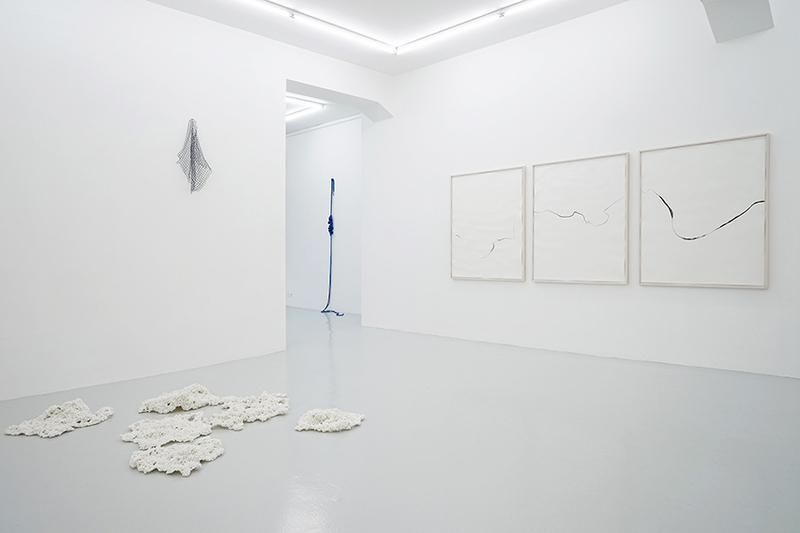 As always her shows evolve in the continuous experimenting of new groups of works. She works meticulously: like a researcher she experiments and expands her image making and invents objects. In her works she remains always tangible as an acting person. Art is for her the making of, a credo she shares with Marcel Duchamp. For this she uses different techniques and activates different procedures. 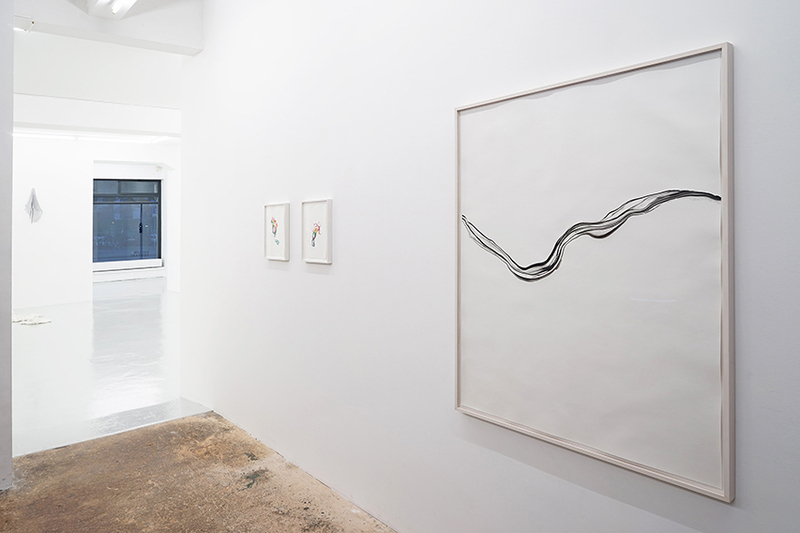 Franziska Furter equips the first room of the gallery with a work on paper in three parts from the Refractions series. These are developments of two earlier series of works the Coronas and Turbulences based on the same principles of production. In her current studio in East London stands a water basin in which she pours an oil-bearing Indian ink and a little bit of surface tension triggering soap liquid. The colours spread over the water surface. At a certain point the artist extracts the resulted image with a sheet of paper from the water surface. She is, in contrast to the group of the Coronas, not aiming for circles, but breaks purposefully the circle and detains on the papers swelling and subsiding black lines, referring in the joined row to horizons and waves, or in the top view hinting to possible river courses. Often the lines find their prolongations in the sheet positioned next to them – sometimes they stop abruptly. These multi-part groups of images recall late medieval winged altars, in which landscape and the course of action are carried on over the single picture fields. 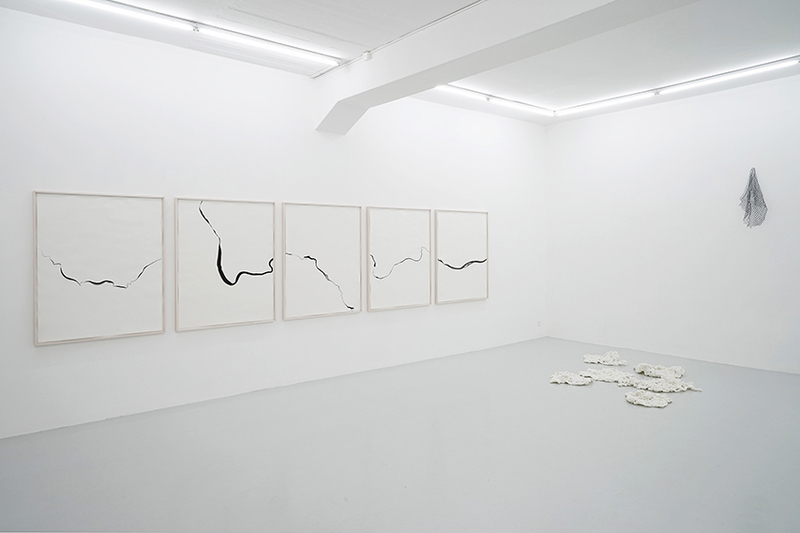 As in the Coronas and Turbulences Franziska Furter follows in these works criteria of planning, concept and coincidence. 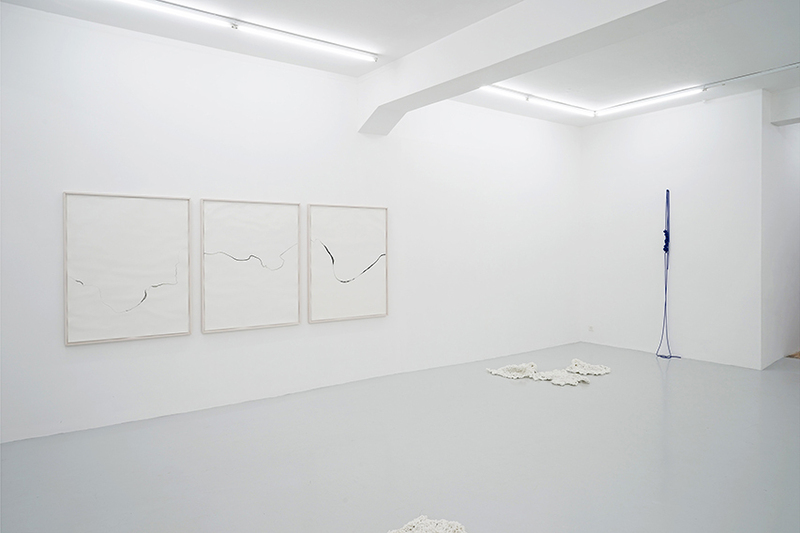 To this triptych are added two blue ropes hanging from the wall, elaborately knotted together at eye level. Franziska Furter calls this series of works Trap. Through the ball of knots the two ropes form a sculptural order. formations or white sponges. Knots exert a special fascination on Franziska Furter. These was already tangible in earlier works as for example Bourdon from 2010. A photograph of Bourdon was used as the cover for her catalogue at the Centre d’Art Contemporain in Yverdon-les-Bains last year. Knots possess in addition to their important role in mathematics, aesthetic, mysterious and magical dimensions, especially coming into effect in the ornament. In Celtic and South-Indian cultures knots are assigned an apotropaic function, the defence and catching of demons. Besides these two groups of works hangs slightly higher a work from the Waveland series, a handmade grid construction of beads and nylon cord recalling the model-like construction of computer landscapes. In the back room hang three works on paper from the Scattered Rainbows series made in the same technique like the Refractions, but as the title indicates now colourful and more controlled by the artist in the water basin. 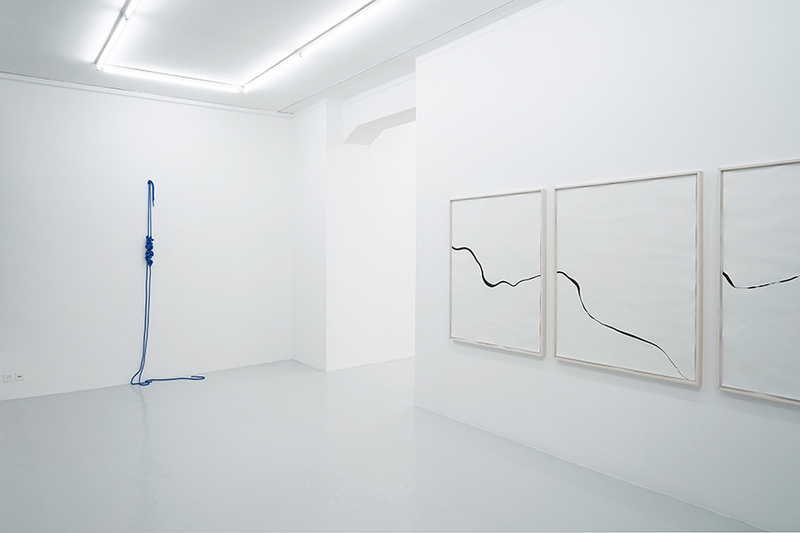 Two black ropes bound together with overhand knots from the series of the Traps complete the exhibition and bound the three rooms together. Franziska Furter has created an installative exhibition captivating the viewer through its precise disposition of different groups of works in manifold material. All works broach the issues of perception of time and play with the criteria of planning, concept and coincidence.